Keel Guard products to shield and protect your boat's keel. Select the color you want. Base your choice on the colour of your boat hull, trim of your boat, contrasting color mix, etc. Many people choose white keelguard on their white boat hull so it is not visible. 1 ft Keelguard Bow Guard for protecting your boat's bow. The original patented keel guard protection product. We are an Official supplier of Keel Guard products throughout the U.S. and Canada. 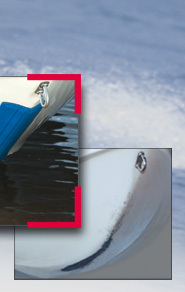 Every aspect of the patented Keel Guard has been designed with boat designers and 3M engineers. Many factors contribute to its success. A precise, abrasive-resistant blend of polymers and urethanes achieve optimal durability and pliability. A pressure-sensitive adhesive creates strength, while permanently bonding and sealing Keel Guard’s contoured edges to the hull surface. Angled grooves produce hydrodynamic channels, creating air pockets and providing a slicker surface. The perfect combination of these factors makes the Megaware KeelGuard the easiest keel protector to install, and give it unparalleled quality and dependability. Wear and damage to your boat’s keel can break down its protective gelcoat finish, allowing water to reach and destroy the fiberglass laminates. The Keel Guard is a very simple product to install; however, the following instructions must be strictly followed. Any short cuts or missed steps will jeopardize and compromise the full bonding capabilities of the 3M adhesive. For best results the KeelGuard should be installed at an ambient temperature of 60º or above. Typically, the Keel Guard is mounted 4 to 6 inches above the waterline on the bow, ending 2 to 3 feet or more beyond the lowest point of the Keel. 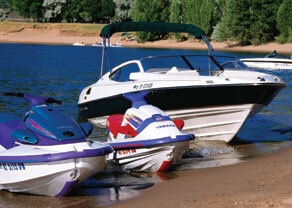 For personal watercraft, begin the KeelGuard approximately 1 inch below the bow hook, running the length of the keel, and ending 4 to 6 inches forward of the pump intake. Note: If your trailer is designed such that the entire weight of the boat rests on rollers or a support beam along the keel, we do not recommend installing the KeelGuard. If the rollers can be lowered or the side bunks raised to clear the rollers, the KeelGuard adhesive bond will not be compromised. Application may not be suitable for some aluminum boats with reinforced rib design. Please contact Megaware KeelGuard for your particular application. KeelGuard has been protecting watercraft of all kinds, including Bassboats, PWCs, recreational boats, professional fishing boats, dinghies, rigid inflatables and coast guard fleets for years. Join Megaware KeelGuard’s trusted customers by protecting your investment with the very best. The KeelGuard is so tough and reliable that we include a lifetime, NO-HASSLE warranty. KeelGuard is guaranteed to protect your boat for life. If problems arise, we replace it for free. It really is that simple. View detailed installation instructions here. KeelGuard comes in several great looking colors to match virtually any boat or PWC. All colors are UV-stabilized for true color that lasts a lifetime. KeelGuard is available in nine standard lengths or can be ordered in custom sizes. Q. How does it stick on? A. The Megaware Keel Guard uses an advanced 3M pressure sensitive adhesive tape already bonded to the KeelGuard. By simply preparing the keel with the provided tools and primer, the KeelGuard adheres to the hull creating a permanent bond, giving you years of protection and performance. Q. Will the KeelGuard create drag and reduce the speed of my boat or PWC? A. No, the KeelGuard is designed with hydrodynamics in mind. Keel Guard's patented drag reduction design will not slow a boat or diminish its performance. In fact, on smaller boats and PWC's it is not uncommon to experience an increase of 1-2 miles per hour on top end speed. Q. Does a dealer need to install the KeelGuard or can I do it myself? A. Many of our dealers can install the Keel Guard for you or you can do it yourself. Each KeelGuard comes as a kit and has all the tools and materials for installation (a cleaning agent i.e. acetone is not supplied due to EPA shipping regulations). By following the step-by-step instructions, you can install the KeelGuard yourself in about one hour or less. Q. Will the KeelGuard go over strakes or chines? A. Yes, the Keel Guard material is very pliable and will easily conform to most hull strakes and angles. Q. What is the KeelGuard made of? A. The KeelGuard is a composite comprised of a blend of polymers and urethanes with special plasticizers and UV inhibitors to provide the very best blending of abrasion resistance and bonding qualities. This combination of strength and bonding has made it possible for Megaware KeelGuard to provide the best lifetime warranty on the market for keel protection. Q. Is it possible to remove the Keel Guard, and if so, will it damage the gel coat? A. In the unlikely event you need to remove a Keel Guard, it can be done. The 3M adhesive is designed to shear apart if enough strength and energy is exerted. Some of the adhesive will remain on the KeelGuard and some on the boat. The remaining adhesive can be removed from the boat with a plastic or nylon putty knife or a decal/pinstripe removal disk. We can provide more detailed instructions upon request. Q. Can I apply the KeelGuard over boat bottom paint or anti-fouling paint? A. The Keel Guard should not be applied over boat bottom or anti-fouling paint. Often times the paint will fail and pull away from the boat taking the KeelGuard with it. Anti-fouling paints are designed to wear off over time, and for obvious reasons are not conducive for a good bonding surface. If boat bottom or anti-fouling paint is already on the boat, it should be sanded off the area where the Keel Guard will be applied. This will insure a permanent bond of the 3M adhesive. If desired, boat bottom or anti-fouling paint can be applied over the KeelGuard once it has been installed. "Your product is outstanding. Recently I purchased a model 102 for my Father-in-laws' 20' Boston Whaler. Now I want to order one to install on my own." "Installation was a breeze, I actually put it on in the parking lot of a casino in Laughlin NV. We sure like it and look at it as a small insurance policy on our investment." "I would just like to compliment you on your clear instructions and a wonderful product. I installed it in about 45 minutes, and it truly looks as if it were part of the original manufactured vessel." "The KeelGuards are working out "great" in our Lethal Weapon stunt show and we would now like to put them on our boats and PWC's at Marine World." "I introduced KeelGuard to my fishing teammates a year ago. We can't believe how well it works and holds up. We fish a lot of timber lakes with rock shore lines and water that is near freezing. Our KeelGuards are as secure as they were the first day we put them on. In fact, my son has one on his boat going on four years now. We are all amazed with your product. Thank you." "I recently purchased a KeelGuard for my boat and was very impressed with your product. I installed the KeelGuard myself and was amazed how simple this task was to do alone. I was equally impressed with how little this product costs that could provide so much protection for a vulnerable area of my boat." "It's unbelievable that a product this strong is offered at such an affordable price! Thanks for protecting our investment with what we call the Megaware &lsquo;tough as nails&rsquo; KeelGuard."